Fletcher Gate from Weekday Cross (A Nicholson, 2004). Fletcher Gate is a street the history of whose name it is rather difficult to make out. Apparently in early days it was the butchers' quarter, and its extreme antiquity is reflected in its earliest name, for in 1335 it is referred to as "Flessehewer Gate," or "Flesh Hewer Gate." Of course, after the Conquest, such a street would be called the Shambles, after the French manner of speech, but our Saxon forefathers spoke of their butchers as "fleshers." In 1744 it is called "Mont Hall Gate," because it led down to the Mont Hall or Town Hall in Weekday Cross, and then it goes back to its old butchering history, and a portion of it at any rate becomes "Blow Bladder Street," probably after the street of the similar name close to the butchers' quarters in London. However, this name struck our forefathers as unpleasant, and in 1800 it becomes "Market Street." But in 1865, when the new street leading from the Theatre Royal to the Market Place was made out of Sheep Lane, it was first decided to call it Theatre Street, but that designation was quickly abandoned and it was re-christened Market Street, a name which has remained to the present day. Of course, endless confusion was caused by having two Market Streets in the town, and after various experiments had been made it was finally decided to return to the old name—Fletcher Gate. During the whole of its long history the northern part of the street appears to have remained under the name of Flesher Gate, or something near it, which gives rise to the suspicion that it may have been the quarters of the fletchers or arrow-makers. Mr. Briscoe, in his "Bypaths of Nottingham History," says that arrow-making continued an industry in Nottingham as late as 1724. Because of its association with the butchers, Fletcher Gate would be particularly subject to mud, and so we find that so early as 1486 it was paved with boulders, and I am rather surprised that the name of Pavement has not somehow or other been associated with it. 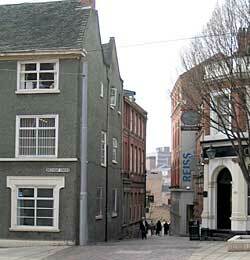 Byard Lane from Fisher Gate (A Nicholson, 2004). The butchers have probably left their mark upon the street called Byard Lane, which leads off from Fletcher Gate, for it is quite possible that "Byard" is a corruption of "byre," the huts in which the animals doomed to slaughter would be kept, but Byard Lane has a far more interesting story to tell than that of slaughter-houses, for it cuts directly across the ancient defence of the pre-Conquest Burgh of Snottingham and probably it represents the eastern gateway of that stronghold. It was first called Byard Lane in 1633, but before that time it was called "Walloon" or "Wooler Lane," which is a corruption of Wall-On Lane, reflecting its connection with the defences. All this history was for the moment lost in 1890, when it was re-christened "Dining Hall Street." Although such a tiny street it has its tragedy, for in 1759 one Samuel Ward was executed for breaking into the house of a certain Mr. Liptrot, who was a grocer at the borough end of Byard Lane. Ward was respectably connected, and there seems absolutely no reason why he should attempt any theft, and very great public sympathy was expressed at his execution, the general opinion being that he had no felonious intent in entering the house. It was generally said that Mrs. Liptrot died of a broken heart after the execution. On the other side of the picture we have the fact that in 1757 Mary White was hostess to John Nelson and other of the Methodist pioneers at her house in Chapel Court, off Byard Lane, which has now disappeared. At the junction of Fletcher Gate and Bottle Lane is a building now used as offices which was called Zion Chapel, and which was erected in 1820 by a body of Independents. There are one or two other facts connected with Fletcher Gate that are not without interest, for example in 1443 a certain Richard Dolby, who was a baker, leased a garden on the east side of Fletcher Gate from the Corporation, and this is the earliest lease on the Chamber Estate. Again in 1761 Dr. Jasper Deane was living in Fletcher Gate, and it was in the street outside his house that he was seized with his fatal illness. Dr. Jasper Deane was brother of Captain Deane, who was one of those strange, romantic characters of the XVIII. century. He was born in the reign of Charles II. in 1679, and though of good parentage he expressed the remarkable wish to become a butcher. When he was of sufficient age this wish was gratified and he was apprenticed to a butcher, with whom he soon fell into evil companionship and he became so notorious a deer stealer that it was advisable for him to get out of the country. He eventually joined the navy, and it is probable that he was at the capture of Gibraltar. Returning to Nottingham practically destitute he, in partnership with his father and his brother, in 1710, fitted out the "Nottingham Galley," which was loaded with all sorts of merchandise for traffic in America, and placed under his control. Unfortunately, he was cast away during a storm off the Newfoundland coast, and not only did the galley become a total wreck, but Deane and a few sailors were stranded for twenty-six days upon a desert island where their sufferings were such as to reduce them to cannibalism. Eventually he was rescued and returned to Nottingham, but his brother, Dr. Deane, behaved in so unreasonable a manner, upbraiding him m season and out for the loss of the ship that the situation became intolerable, and negotiations between the brothers were broken off. However, a reconciliation was arranged and the two brothers dined with seeming friendship at the house of a mutual friend, and upon the conclusion of the entertainment Captain Deane offered to walk home with his brother, but when they got into Fletcher Gate his temper got the best of him and he broke out into a torrent of abuse which became so violent that he was about to assault the Captain, the latter in self-defence pushed him away and he fell down and immediately died from a broken blood vessel, but whether the breakage occurred through the violence of his temper or through the fall it was never decided. Captain Deane took service with the Czar of Muscovy and returned to Nottingham in 1720 with sufficient competence. He settled down at Wilford, where he built the two houses still remaining at the entrance to the village. One day while he was walking in his garden he was set upon and robbed in broad daylight of everything of value that he had upon him. Eventually he died and was buried in Wilford Churchyard, where his grave can still be seen. Mr. Seagrave, who was town clerk to Nottingham before Mr. Enfield, lived in Fletcher Gate, and died at his house there in 1790, but I have never been able to identify the site. Fletcher Gate leads into the curiously short thoroughfare known as Old Queen Street, which was made out of an older foot-passage, blocked up with posts to prevent the circulation of vehicles, about 1850, and it serves to connect the end of Fletcher Gate with the modern Carlton Street. Bottle Lane is a curious little back-water, which really was of considerable importance as a thoroughfare in times gone by. It appears to have originally been called Linby Lane after a certain Hugh de Lindeby, who was Mayor of Nottingham about 1400, and even so late as 1750 it retained this title. 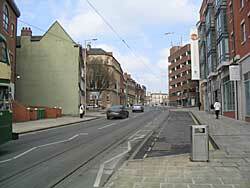 However, it was called Bottle Lane at times, even before its modern re-christening. I think that this title refers to the leather bottles which were in use in ancient days, and has no reference to glass bottles, for there is no evidence of any manufacture of glass in this neighbourhood. It may have been a corruption of "Bothell," which is, of course, a rough tenement. In it was situated, until comparatively recently, a fine old timbered house, of which some relics are preserved in the Castle Museum, which for some reason or other was called "King John's Palace." There seems no reason for associating King John with it, for the present relics are certainly very much later than King John's reign, although of great antiquity and interest.